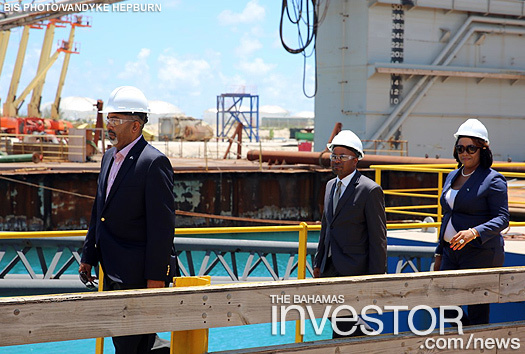 Minister of State for Grand Bahama Kwasi Thompson was joined by a number of government and Parliamentary colleagues during a tour of Grand Bahama Shipyard recently. 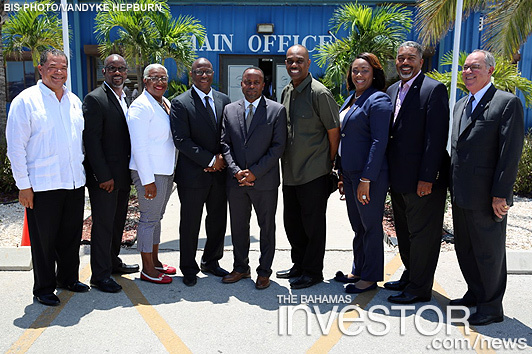 The tour came following a meeting by the team and executives from the shipyard, where discussions on the success of the shipyard, the apprenticeship programme and the future of the maritime business in Grand Bahama took place. Representing the government were Brent Symonette, Minister of Financial Services, Trade and Industry and Minister for Immigration; Dion Foulkes, Minister of Labour; Michael Pintard, Minister of Youth, Sports & Culture; Frankie Campbell, Minister of Transportation and Local Government; Kwasi Thompson, Minister of State for Grand Bahama; president of the senate, K. Forbes-Smith; Member of Parliament for Central Grand Bahama and Parliamentary Secretary in the Ministry of Works Iram Lewis; and Senator Jasmin Dareus. 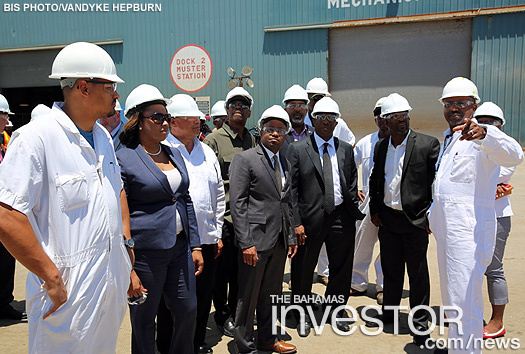 Minister Thompson noted that the visit to the shipyard was the first step in the government’s goal in understanding the business opportunities available for Bahamian entrepreneurs. “We also want to ensure that the public is aware of the fact that the concern is not just about the employment at the shipyard, but also the fact that the shipyard has the ability to provide ancillary services for businesses here in Grand Bahama,” added Minister Thompson. Minister Thompson noted that the government continues to encourage the employment of qualified Bahamians at GB Shipyard. He noted that during their meeting with shipyard executives, before the tour, there were fruitful conversations with respect to employment of very qualified individuals at the Shipyard. Minister Thompson also took the time to congratulate GB Shipyard for being the largest ship repair facility in the world. 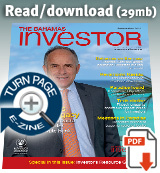 “This is something that we here in Grand Bahama can be very proud about,” said Minister Thompson. The Bahamas Financial Services Board and the Insurance Commission of The Bahamas are partnering again to provide two full scholarships for the Associates in Captive Insurance designation offered by the International Center for Captive Insurance Education.